only ripples in the water"
I came to Norway in the summer of 2016, during one of those seemingly desperate moments in life. I needed an experience that could be my own; a place that still felt untouched, preserved from social media & cheap tourism pervasive in so much of culture today. I needed to turn off, and explore myself in pure, uninhibited nature. Norway provided the outdoors, the solitude, new friends and so much more. I set off from Flåm Beach to spend 5 blissful days paddling across 3 fjords - the Lustrafjord, the Sognefjord, and the UNESCO-listed Nærøyfjord. Before departure is a 5 hour kayak training session to earn Norwegian Paddle Federation (NPF) Våttkort certification. Spending real time outdoors reminds you very quickly how little you need to survive and actually be happy. All of our gear, food and water was stored in the kayaks - these 2-person sea kayaks hold a lot more than you think, but its still a very tight squeeze. Just looking at 5 days provisions, tents, sleeping bags, clothing, water "baby seals", and more seemed impossible to fit. Every nook and cranny is packed - it takes 4 people to comfortably carry a boat into the water! Outdoors you learn to respect both pure self sufficiency and survival with a group. Since many of us in the 7 person group were perfect strangers, building trust and pitching in to work (boat maintenance, camp setup and breakdown, cooking, cleaning, etc) were critical. At the beginning our guide, Marta, was the leader teaching the proper survival methods and quick tips and tricks. By the end, the group was no longer reliant on Marta, we were self sufficient together or alone. It's hard to appreciate the sheer size and majesty of the fjords from the likes of a cruise ship or simply by land. It's not until you find yourself in the middle of open sea fighting winds and currents to make it from one cove across to the next bluff that you begin to realize the scale and presence of the mountains. 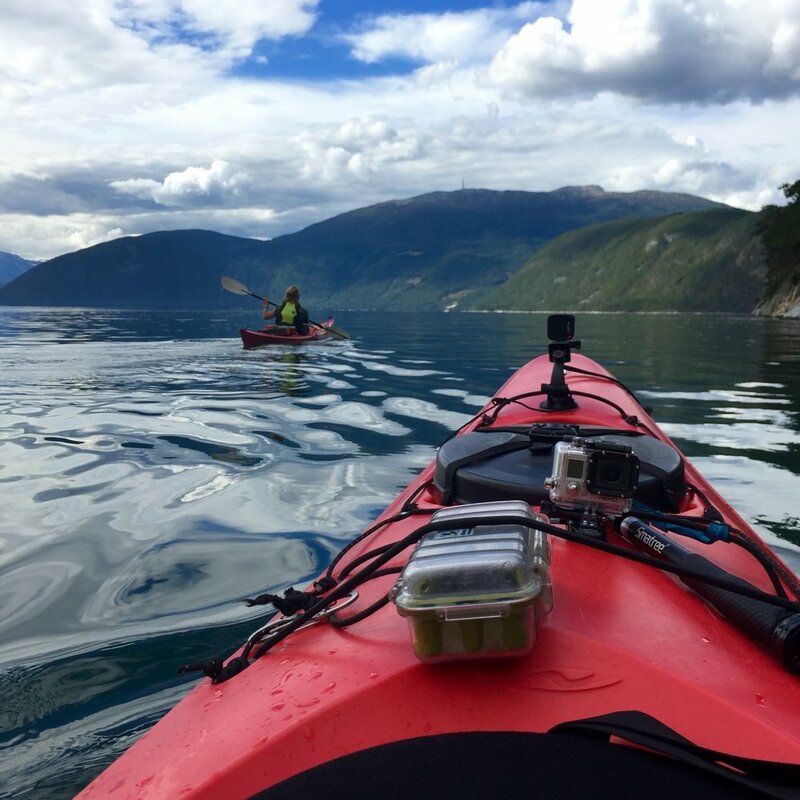 The kayak provides unmatched access to the Fjord's. And paddling through them dozens of kilometers a day leaves you in pure awe of Norway's nature. Every turn is more picturesque than the scene prior. It's literally "take your breath away" beautiful and somehow continues to get better and better. I traveled with Njord. Their guides are specialists in sea kayaking adventures. My guide, Marta, was phenomenal - everything from the paddling techniques she taught us, to our conversations on the water, to her camp side cooking that would rival even some of the top restaurants in NY. Most importantly, Njord follows a very strict and important set of principles called simply "Leave No Trace". The principles in a way epitomize the entire adventure - appreciating the beauty of the fjords, whilst respecting the need for their protection. The Norwegians and their government have done a tremendous job preserving their natural outdoors - as a culture it's extremely important to them.